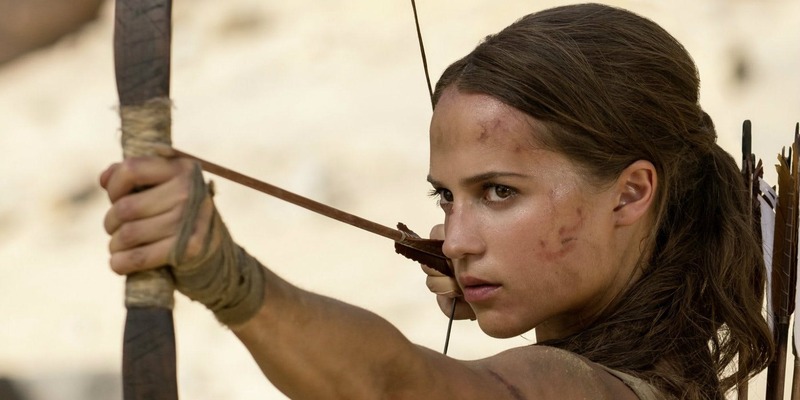 It is easy to declare Tomb Raider the most video game-like video game movie to date; however, Oscar-winning actress Alicia Vikander’s attempts at establishing dramatic control over it are outdone by the naturally goofy atmosphere that any film like this fosters. Tomb Raider, at its best, just passes for an entertaining action movie. Some of its fight scenes are exciting, and in its final act, there’s a neat tomb for a fleshed-out Lara Croft (Alicia Vikander) to raid. However, the ways in which aptly-named director Roar Uthaug goes about depicting his popular heroine – basing her entire motivation on her relationship with her father and constantly having her female physique stop her at critical moments – drop the ball when it comes to establishing a badass adventurer. Given that the film draws a lot of its inspiration from the game’s popular 2013 reboot, it’s discouraging that Uthaug didn’t pick up any of the things that make Croft an interesting character along the way. This is quite a rough start for what will surely become yet another video game based franchise. However, being the first in this suggested franchise, Tomb Raider must be commended for deciding to follow an actual narrative arc by giving us a Lara Croft who has not yet gained the prowess she possesses in the virtual world. Seven years after researcher Richard Croft’s (Dominic West) disappearance, Lara chooses to abandon her father’s estate, living a carefree life instead as a courier where she barely makes ends meet. The establishing scenes go to great lengths to display Lara’s developing athleticism, first showing her as a combatant in a boxing ring – where she unexpectedly loses, and loses badly – and then later as the fox in a bicyclist fox hunt (you read that correctly, and she has the tail to prove it…). Though this sense of athletic amateurship is intriguing given what we know about her from the video games, the intellectual ignorance and emotional vulnerability of Croft’s character is quite unbecoming. Lara seems to have no interest in archeology throughout the film; it isn’t until a puzzle from her father leads her to his hidden lab that she decides to venture, and the only reason she does that much is because there’s a chance she can see her dad again. The influence of this parent-child bond lingers behind every adventure taken, decision made, or word spoken by Croft in the entire film. That wouldn’t usually be too much of an issue, but Lara’s complete devotion to her father eventually compromises the attributes required to compose a powerful heroine. This lessens her onscreen impressions greatly, especially since it’s never really made clear what made their connection special. Uthaug’s sloppy usage of flashback storytelling suggest the majority of Lara and Richard’s interactions were based on him leaving. It’s difficult to buy into a kinship where all they do is say bye to each other, though. His absence is one of the two defining factors to their relationship; the other is the secret half of his life he kept hidden from her, the one she discovers at the end of his bequeathed puzzle. Richard never went on business trips like he led his daughter to believe; he was actually risking his life studying and uncovering supernatural artifacts. A prerecorded message left to Lara explains his research on the tomb of Himiko – a queen whose touch alone could kill – and instructs her to destroy all of his notes on its location. Naturally, she doesn’t do it (“I know you hate being told what to do”), packing up his findings, leaving for Hong Kong, and from there, following his path to the desolate island where Himiko is believed to be at rest. It’s here that the sudden threat of Trinity, an organization also seeking the tomb, enacts Lara’s metamorphosis into the avatar from the game. The latter half of the film sees Croft hastily gain military-style tactical and physical skill. Even though she got arrested for riding her bike, and was forced to tap out in the ring no more than an hour ago, Lara can now navigate through dangerously dense forests, beat down several mercenaries, and free a group of refugee slaves like it’s nothing. This is the Lara Croft audiences paid to see, but the film’s consistent mishandling of her character taints any form of exhilaration her eventual appearance causes, making this transformation feel more like a means of quickly wrapping up production than a reward from personal development. With that said, the island and the secrets that reside in it are the most fun parts of Tomb Raider. The execution of the action sequences is surprisingly well handled throughout these final chapters, but all the weak parts of the first half make it much more difficult to enjoy the stronger sequences in the second, many of which feel like they were taken straight out of an Indiana Jones recycling bin. Despite the natural excitement any high-intensity action scene generates, Tomb Raider lacks a sense of urgency, especially in its supernatural elements. Aside from Richard, no one believes in or is worried by the apparently great spiritual powers that surround them and the island. Lara, like I mentioned earlier, is looking for the island her father is on, not the tomb; and Vogel (Walton Goggins), the leader of Trinity’s expedition, centers his determination entirely around getting back to his daughters. It’s a shame that the filmmakers’ inconsistencies took away from the excitement of the final act, because there’s a lot of fun to be had there. They also didn’t give Vikander a lot to work with in order to make Croft a great and compelling character: one scene of intended significance sees her respond with genuine terror after she’s forced to kill in self-defense. Though the Academy Award-winning actress exerts raw emotion in these dark moments of reality, the feelings are too much out of sync with the rest of the film. It’s always disappointing to watch talent and emotion be wasted like this. Despite these complaints, Tomb Raider, by merely being an OK video-game film, is a great step in the right direction for the struggling genre. It seems that Uthaug got most of the dreary, expositional stuff out of the way early, so hopefully these oncoming sequels will take a hint and give audiences more of what they want.